Dr. Hell and his Mechanical Beasts are back, and they're more dangerous than ever before. Kouji Kabuto and Tetsuya Tsurugi fight a fierce battle against these hellish machines, which are under the command of Baron Ashura. Unfortunately, they are defeated, with Kouji's Mazinger Z being captured and Tetsuya's Great Mazinger seriously damaged by the enemy. The devious Dr. Hell quickly converts the captured robot into Ashura Mazinger and uses it to attack the Photo Power Lab. At the same time, Kouji is missing in action, which leaves Testuya to defend the lab in the damaged Great Mazinger. But the forces of Dr. Hell are too strong, even for a brave pilot such as Tetsuya, and all seems to be lost. The battle seems to be drawing to a close, until an overpowering blast fired by an unknown robot destroys the entire Mechanical Beast army. Could this mysterious robot be the legendary Mazinkaiser, and who is piloting it? There comes a time whenever I re watch this series, I would want to start to review it in order to give examples of why I like the show or not, despite the strange amount of stuff going around. Of course this series is very short but its more so an entertaining value anime. I mean come on. I've seen this more than 50 times and I first watched it at the age of 7. By now I should have been tiring of it. As much as I want to say I'm tired of it I can't deny a bit of the things I feel for the series. Mazinkaiser is a 7 Episode OVA series produced by none other than Studio Brains Base, also the studio behind such works such as Mawaru Penguindrum, Durarara! !, Baccano, Blood Lad, Bokura wa Minna Kawaisou, Isshukan Friends and of course their recent work in the summer 2015 anime Aoharu x Kikanjuu. Of course a few of their works that little amount of them had their problems but for the most part I really love their series. Despite that, should I recommend the series? Well let's find out today in the review for Mazinkaiser the OVA series. Story: To start off, the story is quite simple to explain at least to the people that are new comers. The series starts off with the main Villain attacking the city, as our heroes try to save the day. But on that day a mistake had happened to the main protagonist, which caused him to lose Mazinger Z (if you have seen the original series or the remake) and of course to a degree lose the fight. Then we come to realize he found Mazinkaiser, a powerful robot that goes to complete god. By what I mean is by the direction that Kouji would take back in the remake version which that explains in the remake or the original source adaptation. To start off lets start with the whole story in a short summary. Considering this is just a 7 Episodes OVA series plus the Movie connected to it, it doesn't flesh out too much. The story is not considered badly written, but its still solid to build up at least something to a degree for the Movie. The execution for the series seems very nicely done and along with the monster of the week trope (which actually usually this happened before in the old anime series) but as the episodes progressed it became more and more difficult for out main protagonist to defeat them. And thats what I like about the anime, a bit moreso the challenges. Sure, people would complain about the typical Episode 4 Beach Episode. But to me this episode was at least used at the right way. It also makes at least the main cast par take role of the whole mission and in a funny manner. Overall also the finale was actually one of the most satisfying endings as well. To my eyes the story department isn't the best, but of course it kept its consistencies in a good fashion. Characters: Lets talk about the characters which for me they're the weakest part of the series. It's not like they are terrible because the main cast of characters are funny as hell. Like I really like their interactions and their team works. And THIS ANIME does make me cheer a lot especially for BOSS! Like he didn't gave a damn to whats going on. This anime made him take a big role in the show that he almost took the spot light. I was enjoying the moment and might be one of the memorable moments from him in the anime besides one part of Episode 4. Kouji Kabuto out main hero, is also like your stereotypical shonen protagonist, well in a degree yes. But he doesn't get the power ups like the other protagonist *cough* Natsu Dragneel *cough*. He knows what he has to do and as well he does learn how to control Mazinkaiser. At first yes it was hard for him, but then he completely learned how to master the robot even for a short OVA series. Rather short but as well he does care about the cast of characters (Boss and Sayaka) and trying to protect the world, but thats a cliche but not in a bad way. And now For Sayaka, lets just say Sayaka Yumi took also a part role of the series for at least a slight amount of time. She's strong willed when it comes to fighting unfortunately in this series in the start she was getting beaten, but after a bit she does become cool at the least to a degree. I won't say further, because that's spoiler territory if you ask me. Unfortunately for this series their supporting, at least some of the cast seems quite lacking on presence. Especially Tetsuya (pilot of Great Mazinger) who he only appears a couple of times in the anime especially in the final episodes. For me it could have been a lot better if he can have some presence enough in the series. But as expected, 7 Episodes at times do come to disappointment with this case. Art/Animation: For a series that has been old from the tip of my tongue, I really still like for the most part its animation style. Its so fluid and sometimes even consistent when it comes to the fight scenes, which for me makes it even more entertain and a lot of the fighting scenes feels so well done and looks well done. However for the artstyle for the series considering it was from the 2000's their budget looks pretty low if you ask me. Compared to the actual movie, the art for the OVA looks a bit low standard and quite iffy at times. Of course the designs for the series look realistic enough for me. Their colors at points could be dark toned color for the robots and at points a bit lacking. Its not bad art but moreso above average. Music/Sound: And this is where I take the big guns and go "KABOOM! BLAM!" Nah Im joking with shooting all over the place. The music is by far even by the standards from an old series, one of the most memorable ones I had ever heard and I keep listening to it every time, it uses a lot of the instrumental approaches and of course the trumpets! It just also feels as well nostalgic and I always always listen to it every day, even on the age of 18. The sound itself is marvelous done, as well with the effects that makes it seem more like Kaboom at least from what I can say. For the voice acting, I will say I totally love both the dub and the sub voice acting, but since we're going towards the dub vs sub voice acting, which is superior? well, I personally prefer the dub for the series. Its just well done and you can see the effort done for the series. Especially for Kabuto Kouji's dub voice actor and Dr. Hell's dub voice actor. Enjoyment: I totally would say I pointed the few of the flaws, but I really love the show to death. It has a lot of the things I want in a mecha, or what mecha should be to a degree. Fun action, memorable characters (main cast), and good animation and great soundtrack. Its nothing shameful to say the least. Recommended for those that loves the mecha genre, and for those that want a short series. Mazinkaiser is based on one of the first super robot shows, Go Nagai's Mazinger Z. I'd heard a lot of good things about this seven episode OVA so I was excited to see it. Unfortunately, it wasn't as good as I was led to believe. Mazinkaiser is also the name of the main giant robot in this show. It was originally created for the Super Robot Wars video games and apparently the fan reaction was so good that they decided to make an OVA series based on it. It's set in the Mazinger Z universe with the same characters as Mazinger Z. The characters are pretty archetypal; there's the hero that solves everything with bravery and manly yelling, there's the silly comic relief character, there's the girl, there's the scientist guys that do maintenance on the robots, there's the evil nemesis that wants to destroy our heroes. Pretty basic, but it gets the job done. Anyway, Kabuto Kouji, the main good guy, finds Mazinkaiser, the ultimate unbeatable giant robot, and Dr. Hell decides that he must destroy Mazinkaiser because....he's the antagonist and he feels like it. The problem with the show is that there doesn't seem to be any overarching plot. Each episode stands alone. The last episode was actually really cool but it isn't worth watching six average episodes to get there. The art is based on Go Nagai's original designs so it has an old-school style, which I like. The animation changes style from episode to episode. The first one is done with cels, some are done with real thick lines, and some are just done with computers. The sound is nice. All the sound effects are fitting, you can hear the robots stomp as they walk around and the laser blasts are good. And it has an awesome opening done by JAM Project. I'm more disappointed than anything else. Mazinkaiser had everything going for it, but it still turned out mediocre. Although there is already a 5 review, I disagree with the reviewer on one aspect in that he concludes that it was the lack of over-arching plot that hurts this show. I just can't view it that way because this is how it is for classic Super Robots and this remake could be considered as elevating the quality of these normally tedious Super Robot stories. If anything had Mazinkaiser been further modernized as having an over-arching plot it will only worsen the depth of the characters involved in this series. That said, Mazinkaiser primarily failed in my opinion because it wasn't able to elevate the same euphoric feeling the original SRW Mazinkaiser had which was a design that was so good that if you are just a bit interested in classic Super Robots could make up for everything else about the robot's premise. 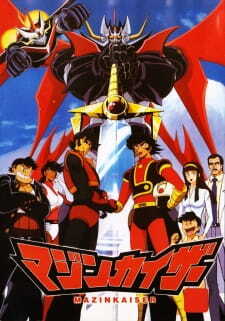 The biggest weakness of Mazinkaiser was that it didn't build up enough of the justification for Mazinkaiser's appearance and instead of opting for a foreshadowing set of events, the scenes were more along the lines of trying to ride the appearance of Mazinkaiser and by doing so the series gives up many potential opportunities to build up both the characters and the mechs - opting instead to be more of a fanservice show that even if you know nothing about the original Mazinger still seems like a weak and not so exciting arc about a Super Robot.